Being relatively new to homeschooling, this got me thinking, “how can I make math more fun for my kids”? How can I teach them basic money skills at such a young age, while also making it fun for them? One thing is for sure, and that is I don’t want them to end up being part of the two-thirds of American adults who can’t even pass a basic financial literacy test. (Yep, I recently read a study called the National Capability Study and found that a large number of adults got fewer than four answers correct on a five-question quiz). The whole reason I chose to homeschool in the first place was to provide my kiddos with a quality education. And I’ve got the power to make it happen. All I needed was a few new ideas to bring back the enthusiasm to my homeschool. Calculate the tip in a restaurant. If you have more than one child (like I do), you can play with the percentages and ask each child to calculate a different percentage. You can even rate the service and debate with your child which percentage tip to give out. Once they’ve calculated the percentage, have them fill out the amount and then do the math for the total. Need cash from the ATM? Some ATM machines dispense $20, $50 and $100 bills. Have your child add up how many of each bill will come out of the ATM machine to complete the total amount you requested. This one is especially good to brush up on their math facts! Is there a birthday coming up? A special dinner or family gathering? I usually create a budget with my children and have them keep track of what it costs to feed everyone, buy the decorations, and any party favors needed for the celebration. Never too early to budget for the holidays. Create a holiday gift shopping budget. I’ve asked my children what gifts they would like to get for christmas and calculate the total cost. Once they know the total cost of everything they want, I have them calculate how much money needs to be put aside on a monthly/daily basis to meet that target. While setting up budgets is fun and super helpful to teach children about the costs involved in things on our everyday lives, where does the money come from? I have my children calculate how much of their allowance needs to be put aside to contribute to the holiday and birthday presents shopping list. I’ve even had them think about what side jobs or summer jobs they can take on to meet that target (babysitting, pizza delivery, tutoring, etc). We have 2 dogs and a cat. So, I started having my children keep track of what it costs to feed and care for them. This gives them a good idea of how much money it costs to have pets if they want one in the future. I almost never create a shopping list for the grocery store, which is not recommended, but when I do remember to create one, I try to stick to it. I give my children the budget that they are to work within and have them calculate the items on the list they will be able to purchase based on the budget. Depending on the item, brand, and price, they select the item. They soon figure out that they may be able to get an additional item from the list if they are cautious with their spend. Since my children are in middle and high school I’ve taken things a bit further and asked them to keep track of all the expenses at home. Utility bills, groceries, gas, and entertainment. You can add even more the list, like mortgage, car payments etc, I just kept it simple (for now). Once they have the numbers at the end of the month, I have them create pie charts to visualize what percentage of our expenses goes towards each category. 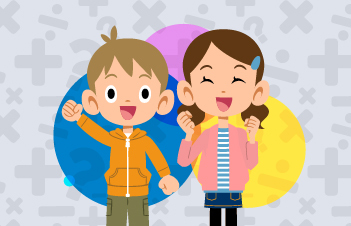 Build a solid math foundation with Time4MathFacts and help students gain thorough understanding of math concepts with Time4Learning’s online math curriculum! I recently came across a report by researchers at the University of Cambridge, commissioned by the United Kingdom’s Money Advice Service, revealed that kids’ money habits are formed by age 7. So, the sooner you start teaching them about money, the better equipped they will be for their financial future. And an allowance is a great way for children to learn about money. A survey by RoosterMoney found that kids ages 4 to 14 received an average of $454 in allowance over the course of 2017, “in addition to cash gifts for birthdays and holidays.” The average child takes home around $8.74 a week. Before you decide on an amount, set some guidelines. For example, you should both understand what the allowance will cover: School lunches? Snacks? Computer games? Extracurricular activities? For older children, big ticket items such as a car or college could be their goal. Write down what they are saving and spending or use an app so they can budget and track their spending habits. Then there is the question about whether or not your child should work for their allowance. I typically give my children an allowance of $10 a week and allowance is strictly tied to chores and rules adherence in my house. For a general view on what other parents pay their children, review the following chart. Using the chart above, a four-year old who saves $1.50 of there allowance each week will have earned $36 in six months. A 14-year-old who saves $6 a week out of their $12 allowance will have earned $144 in six months. The more they save, the better chance they have at buying something that they have their eye on. It’s simple math, a great financial lesson, and it teaches patience. Remember, you’ll not only be teaching your children math skills, you’ll also be providing them real-life expertise on financial awareness and money management. And that’s something they’ll carry with them for their entire lives. 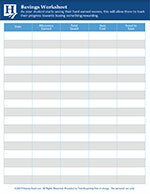 Use this Homeschool.com printable worksheet to teach your kids how to budget their money and manage their finances. Arkansas is a state full of rich history, culture and natural beauty. Homeschoolers in the state can learn about all the distinct aspects that make up the Natural State and more by going on an educational trip in Arkansas. From the diverse landscapes like mountains, forests, and intricate cave systems found in its parks, to the plentiful museums and historic buildings, there is no shortage of homeschool field trips in Arkansas. 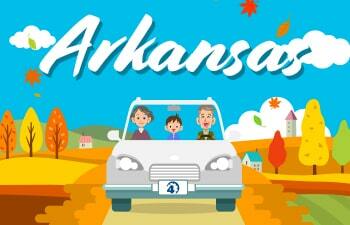 To get started, have your child become familiar with this printable map of Arkansas. They can locate and then label the state capital, hometown, and other important cities. You’ll also find Time4Learning lesson tie-ins that you can download at the end of this post to help supplement your field trips in Arkansas. Home education is not the same in every state. Make sure you’re getting the information you need to start homeschooling in the Natural State. Blanchard Springs Caverns, Fifty-Six – Located in Stone County, this intricate, multi-level cave system is a must in your educational destinations list. Opened to the public in 1973, the caverns feature numerous trails and allow homeschoolers to explore and learn this living cave and how it came to be. Turpentine Creek Wildlife Refuge, Eureka Springs – Animal lovers can explore this 459-acre refuge for rescued wildlife that is home to tigers, lions, leopards, and more, and even features an on-site veterinary hospital. Guided tours are available for visitors as well as day camps for children, workshops and other educational programs. Pea Ridge National Military Park, Garfield – Enhance your history studies with a visit to this Civil War battleground near the Missouri border. Visitors can learn about the Battle of Pea Ridge that took place here in 1862 and its significance. Families can explore the visitor center, museum, and more at this 4,300-acre park. Crystal Bridges Museum of American Art, Bentonville – With free admission, families can take advantage of all the treasures at this 217,000 square foot museum that also features a library and sculpture garden Art enthusiasts can admire the works of artists like Norman Rockwell, Winslow Homer, and more. Homeschoolers can take part in family tours, art activities, and other programs. Cosmic Cavern, Berryville – This limestone cave discovered in 1845 features tons of formations, two bottomless lakes, and more. If you are looking for things to do in Arkansas with your kids, explore the visitor center and museum, as well as the cave tours and gem panning. Reduced rates are available for groups of 10 or more. Mount Magazine State Park, Paris – Check out the state’s highest point at this state park in Logan County that offers over 2,200 acres to explore. Families can hike or bike the numerous trails, observe nature, go for a swim in one of several lakes, or check out the exhibits in the visitor center. Fort Smith National Historic Site, Fort Smith – Located along the Arkansas River, homeschoolers can take in the rich history of this location that features two jails, a courtroom, numerous exhibits and more. Ranger-led programs and walking tours give students insight on how the fort was used and its significance. Arkansas River Valley Nature Center, Fort Smith – Enhance your science curriculum at this center that features numerous exhibits, daily animal feedings, an aquarium, and more. Once you’re done indoors, take your learning outside and explore several miles of trails while keeping an eye out for resident wildlife. Fort Smith Trolley Museum, Fort Smith – Visitors can explore the collection of electric streetcars, locomotives, motor buses, and more at this museum that first opened in 1985. Families can also hop onboard one of the working streetcars for a ride around the local area. Hot Springs National Park, Hot Springs – One of the best field trip ideas are the ranger-led tours, hiking trails, 47 hot springs, and more at this historic park that was established in 1832. Families can explore the visitor center and museum that features various educational exhibits and movies. William J. Clinton Library and Museum, Little Rock – Named after the 42nd president who also served as the state’s governor and attorney general, this center offers a number of tours, free family programs, and more. Homeschoolers can take a day trip to learn about Clinton through three floors of exhibits that detail his life before, during, and after his presidency, and include a Presidential Timeline, his limousine, and a full-size model of the Oval Office. Garvan Woodland Gardens, Hot Springs – This botanical garden, owned by the University of Arkansas, features over 200 acres of eye-catching landscapes. Families can explore the numerous gardens along paved trails on a self-guided tour. A number of children’s programs are available for families as well as special events throughout the year. Museum of Discovery, Little Rock – With more than 90 engaging exhibits, children can learn about various aspects of STEM at this museum that first opened in 1927, making it the oldest in the state. A number of events and educational programs are held throughout the year including Family STEM Night, camp-ins, and more. South Arkansas Arboretum, El Dorado – Explore both native and exotic plants while taking a stroll along the walking trails of this 12-acre arboretum that first opened in 1965. Families can study the variety of trees and flowers such as yellow poplar, beeches, azaleas, and more. There is also a butterfly garden and a variety of animals that call the arboretum home. Millwood State Park, Ashdown – Families can take a quick day trip and spend a few hours enjoying nature at this state park that is known for its bass fishing, bird watching, and more. Whether you walk or bike, a number of trails are available for visitors, as well as a 29,000-acre lake where families can rent kayaks for some fun on the water. Historic Washington State Park, Washington – Bring history lessons to life at this park that features dozens of 19th-century buildings like a courthouse, blacksmith shop, weapons museum, and more. Families can learn more about the significance of this area throughout several eras through walking tours, surrey rides, historic reenactments, and more. Lakeport Plantation, Lake Village – Step back in time at this restored home in Chicot County that was built in 1859. Families can learn about its rich history during a guided tour and numerous exhibits on display. The Hemingway-Pfeiffer Museum and Education Center, Piggott – Home to renowned author Ernest Hemingway and his second wife, Pauline, this location was added to the National Historic Register in 1982. Guided tours are available and allow students to learn about the Pfeiffer family, Hemingway and his work, and more. Delta Cultural Center, Helena – Homeschoolers can learn about this region of the state by exploring this center that was established in 1990. Students can explore the visitor center, the train depot, and the Moore-Hornor House which feature exhibits on a number of topics such as Delta music, the Civil War, and the history of the Mississippi River. Eddie Mae Herron Museum Center, Pocahontas – African-American culture is at the forefront of this center named after the Miss Eddie Mae, who served as the teacher of the schoolhouse for almost 20 years. Built in 1918, this center first served as an AME church, then a schoolhouse. Today, visitors can tour the museum and learn through photos, artifacts, and exhibits with over 200 years of history. AR Field Trips Unit Study Suppl. Is there anything more fun than learning through field trips? To make your experience at these destinations even more meaningful, Time4Learning members will appreciate this download of free activity tie-ins. For thousands of years, the place we know as the state of Kansas was occupied by multiple different Native American tribes. In fact, the state’s name is taken from one of those—the Kaw (also called Kansa or Kanza) Nation. Homeschool families living in or visiting the Sunflower State have a host of possibilities to learn more about the state’s history. For families interested in taking some Kansas day trips, you will find it easy to tie your history curriculum to numerous places where both indigenous peoples and European immigrants have lived out their American story. But history isn’t the only subject you can learn about by taking field trips in Kansas. This midwestern state is also full of natural and cultural destinations. The next time you are wondering, “What is there to do in Kansas?” simply pull up this post of educational ideas for each of the regions of the state. In fact, you can plan out each of your learning adventures on this printable map of Kansas from Time4Learning. Plus, you’ll find a list of Time4Learning lesson plans at the end of this post that can help supplement your homeschool field trips in Kansas. Home education is not the same in every state. Make sure you’re getting the information you need to start homeschooling in the Sunflower State. Biodiversity Institute and Natural History Museum, Lawrence – The almost 9 million specimens and 1.2 million archeological artifacts at the Institute are used for a wide range of undergraduate and graduate research studies, but homeschoolers who visit this four-story collection will also greatly enhance their science curriculum. Special homeschool programs are available to K-12 students as well. Deanna Rose Children’s Farmstead, Overland Park – From learning about growing flowers and vegetables to better understanding Native American history, children who visit the Farmstead will leave knowing more than when they arrived. If you are looking for things to do in Kansas with kids, definitely add this fun and educational destination to your list. Ernie Miller Park and Nature Center, Shawnee Mission – Just outside the hustle and bustle of the Kansas City streets is this natural oasis offering three miles of hiking trails that cross multiple types of habitats, including a stream to explore. The Nature Center uses live animal displays and interactive exhibits to teach visitors more about the park’s plants, animals, and history. Kaleidoscope, Kansas City – You probably normally associate Hallmark with schmaltzy cards and movies, but did you know that at the Hallmark Visitors Center in Kansas City, they also offer a free creative arts venue for kids? Visitors in grades K-6 can access the wide variety of art materials during 50 minute sessions throughout the day. Kansas Museum of History, Topeka – One of the best field trip ideas for families doing a Kansas unit study is to visit the state history museum. During their tour, students will get the full scope of the story of the Sunflower state, from its days as home to indigenous tribes to recent times. 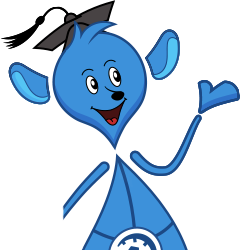 Educational lesson plans are also available on the website. Schermerhorn Park and Nature Center, Galena – Did you know that a small part of the Ozarks actually extends into Kansas? That means that you have a prime opportunity to enhance your geography studies with a visit to this site where you can explore limestone bluffs as well as a 2,500 foot long cave. A nature center is on location, as well. 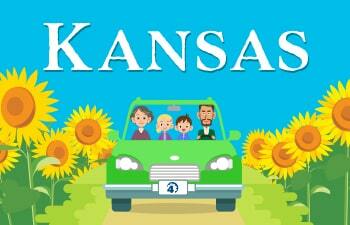 For additional Kansas field trips ideas, visit A2ZHomeschool’s Kansas Field Trips page. Do you have any additional Kansas field trips we didn’t mention here? Add them in the comments or share them on our Kansas Homeschool Support forum! Flint Hills Discovery Center, Manhattan – This culture and science museum is an incredible resource for those in the Flint Hills Region. Visitors can explore over 10,000 square feet of interactive exhibits and traveling exhibitions. A children’s play area introduces younger students to the plants and animals of the tallgrass prairie. Museums of Hillsboro – The city of Hillsboro is home to four historic sites that would make for a terrific educational trip. The first of these is the Pioneer Adobe House, a Mennonite home built in 1876 from adobe bricks. Other historic sites include the Friesen Dutch Windmill, the Kreutziger School House, and the Schaeffler House. Red Rocks State Historic Site, Emporia – The former home of Pulitzer Prize winning journalist William Allen White is open to visitors from April through October each year. Many famous dignitaries and presidents including Theodore Roosevelt stayed with the author at his home, and artifacts and pictures are on display. Visitors can also view the printing press that White used as editor of the Sage of Emporia. Sunset Zoo, Manhattan – The animal lover in your homeschool will welcome a day trip to this destination with exhibits of over 200 animals. But in addition to animal studies, students can also learn about native Kansas plants in the multiple gardens located within the zoo environs. Discounted admission prices are available to groups of 20 or more, so this would be a great trip to coordinate with your local homeschool support group. Dwight D. Eisenhower Presidential Library, Museum, and Home, Abilene – The 34th president of the U.S., Dwight Eisenhower, grew up in the town of Abilene, KS. If you are looking for field trip ideas in Kansas that easily tie into your history curriculum, look no further than this museum that allows homeschoolers to find out more about Eisenhower’s youth, military career, and time as president. Hutchinson Zoo, Hutchinson – Education is definitely the focus of this small zoo on the prairie. For families looking for free field trip ideas, you should note that this destination has no admission charge! Train enthusiasts will love the opportunity to ride the Prairie Thunder railroad, and if you live nearby you may want to take advantage of nature camp opportunities. Pawnee Indian Museum, Republic – The remains of a Pawnee village were uncovered during an archaeological excavation, and are now open to visitors. Students can view the floor of a large Pawnee earth lodge as well as items made from bison bones, European metal trade items, and a star chart painted on buckskin. Peterson Farm Brothers, Assaria – This family-owned farm offers a unique field trip opportunity. Families of up to 8 people can actually stay overnight on the farm and visit the three farmsteads, view the crops and animals, and even take part in farm activities. This would be an ideal tie-in to a unit study on farming or agriculture. Big Well Museum, Greensburg – Do your science lesson plans include an upcoming chapter on water? If so, you might want to schedule a field trip to the world’s largest hand-dug well. This marvel of engineering was completed in 1888 and visitors can descend the giant spiral staircase to view it for themselves. Monument Rock and Castle Rock, Gove County – These ancient chalk beds have eroded into highly intricate spire-like designs over thousands of years. As the rock formations continue to erode, fossils can often be made out on the surface. The nearby Keystone Gallery has information about the formations that students will find interesting. Nicodemus National Historic Site, Nicodemus – For homeschoolers interested in field trips connected to Black History Month, this destination highlights the involvement of African Americans in the western expansion of our country. The five historic buildings on the site represent the oldest and only black settlement west of the Mississippi River. Sandsage Bison Range and Wildlife Area, Garden City – More than 100 bison roam this protected area, but many other wild creatures such as prairie dogs, mule deer, and migrating waterfowl inhabit the area as well. Tours to view the bison up close must be reserved in advance. The 47-acre Lee Richardson Zoo is only a mile from this site, and would make a great addition to your day trip. Is there anything more fun than learning through field trips? To make your experiences at these destinations even more meaningful, Time4Learning members will appreciate this download of free lesson tie-ins. You are not the only one who will learn and experience exciting and inspiring tips and lessons at a homeschool convention. Your children will, too — if you bring them along. The question is, how do you keep them occupied and happy while you attend different sessions and visit the multiple vendors? Luckily for you, most homeschool conventions offer activities and programs specifically for children. For more information on these activities, you should check the convention website and sign up for these programs prior to attending. Keep in mind that many conventions don’t offer on-site registration. Childcare options are almost always available at homeschool conventions. But before you sign up there are a few things you should investigate. As you review the activities and programs on the convention website, know that some conventions have age restrictions. These programs also add an additional cost, which could be around $50 to $85 or more, depending on the activities provided and the amount of days they will be attending. Some homeschool conventions provide lunch or snacks for the children. If they don’t, or if your child has food allergies, prepare your own snacks and meals. Check out the specific times for check-in and pick-up and make certain they don’t interfere with your plans. Many conventions offer craft making, science experiments, and other collaborative activities that invite interaction. Some also offer faith-based programs for children. Whatever the case, these activities should mesh with your homeschooling philosophy and objectives. Before you decide, contact the company or organization that’s running this “kid convention” and make certain they have a good reputation. Also, inquire about the environment and the number of employees who will be working with your children, especially if your child has special needs. Lastly, always sign up before the convention — on-site registration is rarely offered. Bringing a spouse or grandparents along will increase expenses but it will also solve most logistical problems. For example, if you and your spouse attend you can easily take turns watching the children as the other spouse watches the guest speakers and communicates with vendors. Many hotels that host the convention have pools and other activities for children who have adult supervision. You could also extend your stay and treat this as a mini vacation. The host city or town will most likely have historical sites, parks, tourist activities, and more. Choose a few locations and learn about the history, the people, and the culture. Perhaps the city or state is known for a certain cuisine like New Orleans, Chicago, or Texas for barbecue. What a great way to bond with your family as you enjoy a special meal and spend valuable time together. This age group will probably be the most difficult if you are attending the homeschool convention alone. Many convention organizations don’t have programs or daycare for very young children, so you’ll be responsible for caring for your child and keeping them occupied. Pack toys that don’t make noise and let your child play quietly. Books, crayons, stickers, and a favorite stuffed animal are always a hit. If the organizers allow young children in the sessions, bring along a blanket or some other comfortable baby carrier and sit in the back. Many people record the guest speakers, so if your child starts making noises or becomes upset, you should leave at once. Many moms bring baby slings and carry their children along as they visit vendors and chat with other homeschooling parents. Most convention organizers understand that children will be attending and make it as easy as possible for you to maximize your homeschool conference experience. Just remember, prepare early and review the rules, possible restrictions, and activities offered. Once you’ve signed up and have a plan in place that fits your family’s needs, it’s go time! Enjoy. For some families, March 14th can seem like just an ordinary day. For others, though, 3/14 is more than just a day…in fact, it’s Pi Day! Pi, which is considered a mathematical concept that represents the ratio of a circle’s circumference to its diameter, starts with 3.14 but continues for 2.7 trillion digits! Why is Pi Day Important? Pi Day is the day that mathematicians celebrate pi and all the innovations it has contributed to. In 2009, Pi Day became a national event, recognized by the House of Representatives through Resolution 224. The day is officially recognized to create more awareness and excitement towards science and math. Pi has been used as far back as 4,000 years ago and has since been used by NASA to send spaceships to outer space and super computers. The use of pi has aided in the advancement of civilization, and it would be impossible to think of where we would be without it. Celebrate the number with these Pi Day activities! Bake a pi(e)! There are all sorts of pie recipes from beginner to advanced. To make this apart of your Pi Day math activities, you can calculate the area and circumference of the pies you make! For circumference, the formula is 2 x π x r, with r being the radius of the pie. The radius is half the diameter of the pie. For area, the formula is π x r2, so grab a calculator, some plates, and your baking ingredients. Don’t forget to have fun! Difficult pizza from scratch – yes, pizza counts as pie! Make a paper chain for each digit of pie, and the different digits can be represented by various sheets of paper. For instance, blue paper can be for all “1” digits, pink for all “2” digits, and so on. See how long your child can make the chain before getting tired. Pi bracelets are similar to pi paper chains, except they are far more fashionable. Gather 10 different colored beads and string to make bracelets. Assign a color to each digit 0-9, and see how many digits of pi you can fit onto a bracelet. Take it to the next level, and you could make a pi-necklace with even more digits! Make a bar graph for each digit of pi; your student may notice that this bar graph resembles a city skyline. Have your student color the bar graph however he or she wishes – encourage creativity to make a unique pi-city. Using each digit of pi as the amount of letters in a word, make up a story! For instance, a story would begin with a three-letter word, a one-letter word, and then a four-letter word. Allow creativity to fly, and see how far your students are willing to go. Host a pie-eating contest, and for an added twist, blindfold or tie your students’ hands back. This can be a fun way to wind down after an otherwise normal school day – the more the merrier! Challenge your child to see how many digits of pi he or she can memorize. The world record is over 67,000 digits! Again, the more the merrier with this activity – if you have more than one child participating, turn it into a contest. Create a pi-haiku! Each digit of pi can represent the amount of syllables a line can contain. For instance, a three-line pi-haiku would be three syllables, one syllable, then four syllables. Watch (or read) the story of Sir Cumference and the Dragon of Pi! 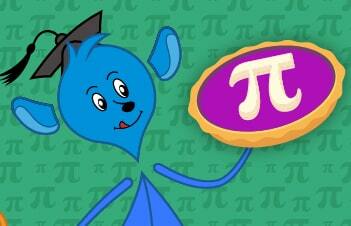 This fun and educational story provides students young and old with a way to learn about pi. As an added bonus, have your child write a short summary or report of what they learned from the story. Unleash the artistic ability of circles! This activity works best with multiple students. Cut out multiple circles and assign each child to color a quarter of a circle. Put all the circles together and create a beautiful collage. For your Pi Day games, you can create a scavenger hunt. Hide as many circular items as you can in a room. Once your child finds a circular item, instruct them to find the circumference and area of the circles (see #1 for how to calculate these values). If they find all the objects and calculate the values correctly, award them with a prize (perhaps the pie from activity #1). Create a list of all the words you and your student can think of that start with “pi.” For added educational fun, skim through the dictionary once your student has run out of words to think of. What’s the most interesting word you found, and what does it mean? Since pi has so many digits, it has been said that people’s birthdays (yes, day, month, and year!) can actually be found in its many digits. See if you and your child can spot his or her birthday. If not, there’s already a website that can find it for you! How commonly is pi day observed? Take a trip to your local stores and bakeries to see if there are any special deals on pies. If there are, see if you can calculate exactly what the price difference is between normally priced pies and discounted ones. March 14th may be known as Pi Day, but what other special events and occasions have occured on March 14th? Conduct a historical search with your child and figure out what the most exciting or interesting event that has even occurred on March 14th. For older students, you can assign a paper or project on the topic. Take to the web to find some fun Pi Day worksheets! There are many free printables across the Internet to enhance your learning experience on the day. Hold a spelling test for younger students using words that begin with “pi.” Read out the words below and see if your child is able to spell them correctly! Washington, DC has breathtaking wetlands, rivers, streams, and remains as a unique American city because it was established by the Constitution of the United States to serve as the nation’s capital. The site of the District of Columbia along the Potomac River was first selected by President George Washington. This unit study supplement gives you information regarding Washington DC facts and history, geography, and fun, beautiful destinations to visit. Historical Facts About Washington, D.C.
Before Washington D.C. became our nation’s capital, there was much debate about where it should be located. All 13 colonies wanted to ensure they were represented equally and that the location should be somewhere in the middle. Not too north, not too south. In 1790 the location was designated right between Maryland and Virginia and was named Washington DC in honor of George Washington and DC “District of Columbia” in honor of Christopher Columbus. During the War of 1812 against Great Britain, enemy forces invaded the city and burned much of it to the ground, including the newly completed White house, the Capitol and the Library of Congress. After the devastation, the city remained small, especially in terms of permanent residents. The city only increased in size as a result of the Civil War. Slaves owned in Washington were emancipated on April 16, 1862, nine months before the Emancipation Proclamation, and it therefore became a hub for freed slaves. After, it remained a home to a significant and vibrant African American population, which included abolitionist Frederick Douglass. The first neighborhoods were those that grew up around the Capitol, the Center Market, and the White House. The expansion of streetcar lines in the mid-19th century spurred creation of new suburbs. It remains a vibrant and culturally diverse city today. After more than 200 years as the nation’s capital, Washington has developed as a city enjoyable for locals and visitors. Today, you can have the best of both worlds by delving into the nation’s past with a visit on the National Mall and museums or local residences. A bill passed to locate a new capital along the Potomac River. George Washington picked the site. The Congress moves back into reconstructed Capitol. Geographical Facts About Washington, D.C. Here are some Washington, D.C. geography facts you and your homeschooler may want to note about Washington, D.C’s unique features. To enhance your study of Washington D.C.’s geography, check out the geographical facts mentioned below. Washington, D.C., is bordered on the west by the Potomac River, which divides D.C. from Virginia. The Anacostia River runs through its east side. Washington, D.C. is only about 68 square miles. It is divided into four sections including the Northwest, Southwest, Northeast, and Southeast, meeting in the center at the U.S. Capitol building. The Washington Monument is 555 feet, 5 1/8 inches tall. It is the world’s tallest stone structure and tallest obelisk. The Old Stone House at 3051 M Street NW in Georgetown, Washington, D.C. is the oldest unchanged building in the district. It dates back to 1765. 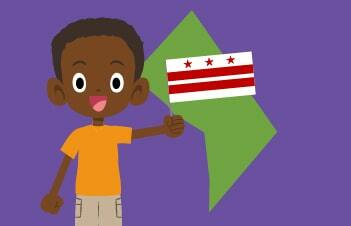 Activities for Children in Washington, D.C. Whether you homeschool in Washington D.C., or are just visiting, below is a list of field trip ideas that will bring the facts about Washington D.C. to life. 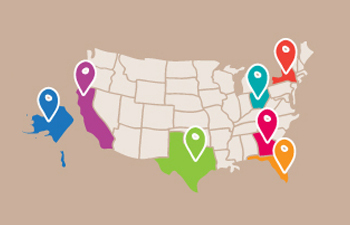 You’ll find everything from science museums to outdoor activities in national parks. Smithsonian’s National Zoo – at the National Zoo you can count on your family’s experience to be special and enriching. Make sure to check out the Zoo activity sheets to keep your little ones (and big ones too) busy. You can also enroll your children in their fall and summer camps for a wild time learning experience! National Mall and Memorial Parks – One of DC’s most popular attractions is in fact a national park. There are around 146 acres, featuring America’s monuments to founding fathers, civil rights leaders and fallen soldiers, as well as breathtaking museums with amazing collections of art and artifacts. You can feel so close to history with a visit to one of these amazing memorials. Constitution Gardens – Take a break from the bustling city, and visit this magnificent display of gardens. There are over 55 acres and it is a living legacy to the developers of the United States Constitution. The gardens serve as a unique urban nature preserve. Smithsonian Museum – the operation operates not one but 17 museums in the D.C. Metro area that offer free admission. Many of these are on the National Mall—including the Natural History Museum, American History Museum, the Air and Space Museum, and the Hirshhorn Museum and Sculpture Garden. Listen to the Drum Circle at Meridian Hill Park – Off the normal tourist track, the drum circle is one of the city’s longest-running traditions. For 50 years, men and women have been gathering at this National Park Service-run park on Sundays in the summer, bringing their own instruments to join in, or just listening to enjoy the afternoon. Rock Creek Park – The oldest urban park in the National Park Service system, Rock Creek Park is more than 2,000 acres long in Northwest D.C. It’s got hiking trails, picnic grounds, an amphitheatre with a summer concert series, bicycle paths, a tennis center, ranger-led programs, a nature center, a planetarium, and more. 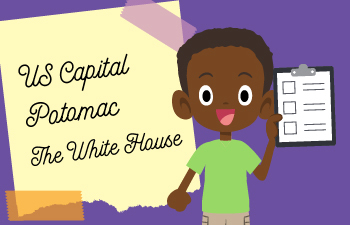 Learn even more about the nation’s capital and test your child’s knowledge about Washington, D.C. facts and information with these free learning resources. Any homeschooler who has attended a convention will tell you, preparation is key. Without it, you’ll probably spend more time waiting in line, battling the crowds, and wandering around aimlessly rather than fully experiencing and learning about all the things that conventions offer. And the earlier you begin prepping, the better off you’ll be—because these events sell out quickly, especially the most popular speaking sessions. When you register early, you’ll be eligible for the “early bird” discounts. There may even be pre-early bird registration packages that offer even bigger savings and discounts. You can use the savings towards other things such as purchasing new homeschool supplies, or putting it toward your hotel or car rental. Find the website for the homeschool convention and review the schedule and print out the map. Once you know the sessions that are available, choose the ones that will help you meet your goals and improve your homeschooling experience. For example, perhaps your child has a learning disability or is struggling with math. If that’s the case, then focus on the sessions that will equip you with the strategies and techniques required to improve their skills and enhance their education. Sessions fill up fast, so sign up as soon as possible. If there are scheduling conflicts, you can always purchase a recording of the session you can’t attend or get the contact information from the appropriate person and email them at a later date. Once you have the map, highlight the vendors and booths that you’re interested in visiting. Locate the restrooms, (very important! ), the food stands, and information booths in case you have questions. If you are traveling with your family, make sure everyone has a map. If your children are attending, highlight the areas that are specifically for kids. Hotels fill up fast, especially if the conference is connected to a hotel. Book a room as soon as possible and inquire about possible discounted rates. If the conference is not near the hotel, find out if the hotel your staying at offers a shuttle. If not, price out what a taxi will cost or you can rent a car. If your room includes a refrigerator, bring along snacks. This will cut down on food costs. Make sure you also book your flight early. Homeschool conventions take place all across the country, so if you can’t drive, price out the best air fares. If you’re not renting a car, inquire about shuttle services to and from the airport. The concierge at your hotel will probably have all the information you will need. What are the products I’m definitely going to buy? What curriculum options will help me improve the subjects where my children struggle the most? What products do I want to test out but perhaps not purchase? Once you understand your needs, look over the vendors who sell the products that you’re interested in and mark them on your map. Jot down any questions you have about the products. You may forget once you’re in the crowded and noisy convention room. Besides packing your basic clothes and toiletries, you’ll need an extra suitcase with wheels for storing all the things you buy. Some conferences hand out free bags, but it’s a good idea to pack your own cloth bag for the free handouts you’ll collect. Also, comfortable shoes are a must—you’ll be on your feet a lot! And don’t forget your laptop, tablet, or notebook and pens for taking notes. You can use your phone for taking pictures and videos if necessary. If you’re traveling to the convention with children, don’t forget snacks, activities, and games. This will help keep them busy. One other thing, buy water in bulk when you arrive. Keeping hydrated is important—and bottled water costs a fortune at the conference. Depending on the time of year and location, you could be facing very cold or hot weather. Look up the forecast before you leave and dress appropriately. Sometimes the convention rooms are a little cold or hot. Depending on your personal comfort levels in these environments, it may be a good idea to bring a light jacket or dress in layers so you can take off the outer layer if you become uncomfortable. Many people frown when they hear the word “budget.” They think of long hours at the kitchen table crunching numbers. That’s not the case, especially when your budgeting for a homeschool conference. But you should be detailed when creating your budget. Include expenses such as money spent on curriculum tools, materials, meals/snacks, travel, and hotels and anything else you purchase. As you’re preparing for the conference, keep a record of what you’re spending and continue as you attend the conference. For example, jot down what you spend on breakfast, lunch, and dinner. 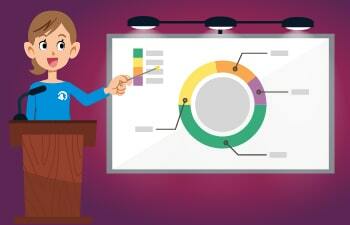 This way you’ll understand your spending habits and adjust them when you attend another conference. But the first thing you should do is start saving early for the homeschool conference season so you’ll have the money set aside. This will prevent any financial stress related to the conference season. Once you have sum determined, manage your conference finances according to the money you have saved. If that means only eating at a restaurant once or twice during your visit, then so be it. Just making an effort to manage your finances is a great start! Homeschool conventions are fun and informative but they can also be overwhelming at times. If you have a plan it will make things much easier and efficient. With that in mind, start planning early and make a checklist. Once you check off all the tasks, you’ll be prepared for an enlightening experience. There is nothing like the hustle and bustle of a homeschool convention. Apart from being a treasure trove of information, there is so much to fill your family’s time: the exhibit hall with dozens of vendors, workshops and seminars with homeschooling experts, and exciting children’s activities. No matter where in the country you homeschool, chances are, there is a convention going on in your state at some point during the year. But we know it’s not always feasible to attend a homeschool convention, whether it’s finances, distance, illness, or any other hindrance. That’s why we’ve put together this list to help you take advantage of all that conventions have to offer even if you can’t physically be there. 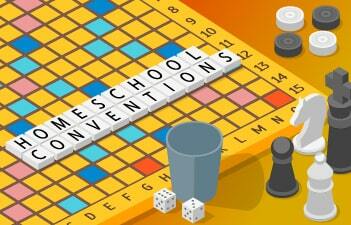 Virtual conventions – More and more organizers are turning to technology to reach homeschooling families. Virtual conventions feature vendor halls, speaking sessions, and even Q and A sessions—just like traditional homeschool conventions. These are perfect for families who are unable to travel for whatever reason. Like traditional conventions, most virtual conventions charge a registration fee. Curriculum fairs – Many homeschool groups, co-ops, and charter schools hold smaller curriculum fairs on a yearly basis. Although some of these are only available to members, it’s definitely an incentive to join a local homeschool group or co-op. Some of these events also allow you to sell your used curriculum. Families can also purchase curricula, meet with vendors, and sit it on speaking sessions and workshops. Homeschool groups and co-ops – If you’re a member of a local homeschool group or co-op, why not consider starting your own curriculum fair or mini-convention? Other families will probably be more than happy to donate their time and talent by helping contact potential vendors, coordinate dates/times, find a location, etc. Podcasts/Videos – Learn about all things homeschooling, or any other topic that you’re interested in, with these insightful digital series that you can download or stream. These are especially appealing to busy families since you can listen or watch from any computer or mobile device. Check out our own video on what to do if you can’t attend a homeschool convention! Seminar/workshop recordings – Some convention organizers may allow you to purchase recording of the seminars/workshops. It’s important to note that many organizers only allow attendees to purchase these recordings on-site during each specific convention, but it definitely doesn’t hurt to reach out and ask. You may also want to reach out to individual speakers to inquire about purchasing a copy of their session. (Sample emails below). TED Talks – These online videos are available in a number of different topics, including homeschooling. In addition to being free of charge, you can access them anytime in a number of languages. Online forums – While attending a homeschool convention provides you with the opportunity to meet with other like-minded families in person, there are communities online where you can just as easily chat with other homeschoolers, ask questions, receive advice, and more. You can start with the Time4Learning Parent Community and Forum or A2Z Homeschooling. Free trials/demos – One of the many perks about attending a homeschool convention is that you get to demo different curricula on the spot. However, many online programs offer potential members free trials so you can determine if it’s a good fit. During this trial period, you also have access to customer support so you can ask any questions just like you would at a convention, but from the comfort of your home. If cost is a reason that’s keeping you from attending, below are a few ideas that can help. Volunteer – The majority of conventions welcome volunteers with open arms. This will allow you and your family to attend for free in exchange for several hours of your time. This is especially beneficial for families who are close enough to a convention that they can simply make the drive each day without having to spend money on hotel accommodations. Discounted hotel rates – The larger conventions usually secure group rates at area hotels. This can sometimes help save your family hundreds of dollars, while staying at quality hotels, some of which include free breakfast. Many of these hotels are usually within walking distance to the convention center, while others offer the convenience of free shuttle service. If there comes a time that you have the opportunity to attend a homeschool convention, be sure to check out this handy convention prep list that helps guide you as you make your plans. How have you reaped the benefits of a homeschool convention in the past without actually attending? Let us know in the comments and share your tips. My name is _______________ and I am a homeschooling parent to ______children. Unfortunately, I wasn’t able to attend the __________ Convention in __________, but I’m very interested in your workshop titled ____________. Do you have a recorded copy available for purchase? Unfortunately, I wasn’t able to attend the __________ Convention in __________, but I’m very interested in ____________’s workshop titled ____________. Do you have a recorded copy available for purchase? For us, homeschool conventions are more than an opportunity to get the word out about Time4Learning. Each year, we are fortunate enough to be able to travel all over the country to meet homeschooling families just like yours. We love hearing your stories, learning how you came to homeschool and getting to know your families. In addition to our usual stops in places like Texas, Ohio, and California, this year our itinerary will include two new locations that we are very excited about: Alaska and New York. For both new and experienced homeschoolers, these shows are such incredible opportunities to learn. There is so much to see and do that it can be easy to get overwhelmed. Being prepared allows you to schedule your days accordingly so you can take advantage of all the educational workshops and informative speaking sessions, while still having plenty of time to explore the vendor hall. This homeschool convention prep list will be a huge help as you make your plans, so be sure to check it out. Safe travels and we hope we’ll get to meet you this year! 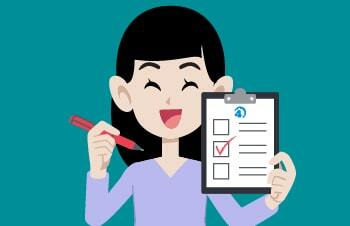 Is there a homeschool convention you would love to see the Time4Learning team attend? Let us know in the comments. Planning on bringing your chid(ren)? Make sure to check out these activities to keep them busy while you attend the convention. Can’t make it to any of these conventions? That’s ok! Whether you need to stay put due to finances, conflicts in schedule, or any other reason, there are still lots of way to reap the benefits of a homeschool convention without even leaving home. Find out what they are by reading our ideas and suggestions. Oh, the thinks you can think when you are a homeschooler celebrating National Reading Month! Every month we try to read at least one new book, but this month we have another excuse to really go all out with reading! It is National Reading Month! I’m getting my kiddos excited about National Reading Month by kicking things off with Dr. Seuss Day on March 2. That is Dr. Seuss’s (Theodor Seuss Geisel) birthday, and the perfect day to highlight the amazing bibliography of this celebrated author. 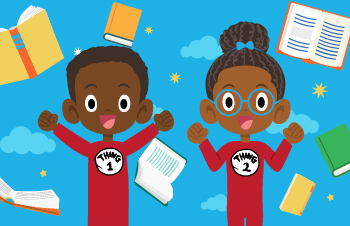 It’s also the ideal way to emphasize the importance of reading and literature—as well as to recognize the most important fact of all: reading is fun! As I’m planning my homeschool schedule for that day, I hope to include one or more of the following Dr. Seuss reading activities in my agenda. Oh, the places we’ll go by incorporating an extra dose of word play and imagination into our curricula on this special day of commemoration! 1. What Pet Should I Get? No one made rhyming more fun and more attainable than Dr. Seuss. Practicing rhymes builds skills in phonemic awareness. On Dr. Seuss Day, I’ll try to turn our regular homeschool schedule on its ear by requiring that every time my child wants to ask a question, they must make it rhyme. Do they want to know where their math book is? Then perhaps they will ask, “I don’t know if I left it in the bath, but can you help me find my book of math?” Do they want to know what is for lunch? Then maybe they will inquire, “I don’t even have a hunch so can you tell me what’s for lunch?” We may include a game of Rhyme and Climb for some additional fun and practice. What is better than combining everyone’s favorite breakfast item with an opportunity to build STEM skills? I’d like to combine this physical science experiment from Science4Us with a reading of the book that made Sam I Am so very famous. And after my homeschooler observes whether eggs float better in saltwater or freshwater, it’s a good bet that we’ll scramble them with a side of ham for a midday snack! One of the National Reading Month activities that many schools host is a read-a-thon. Usually, each grade will give students a goal of a specific number of books that they will aim to read in a limited time frame. Why do schools get all the fun, though? I’ve decided there is no reason we can’t celebrate Dr. Seuss Day by setting our own homeschool goal. Maybe for my older homeschooler the goal will be to read a full chapter book in that day. I would imagine that younger homeschoolers might be able to complete 2-3 picture books in a single day. Whatever the goal, the skill that students build with challenges like this one is reading fluency—a key milestone toward reading success. Preschoolers shouldn’t be left out of Dr. Seuss Day—after all, “a person’s a person…no matter how small!” Every preschooler loves a scavenger hunt, so on this particular day, why not scavenge for letters? How fun would it be to go on a hunt through the house to try to find all 26 letters? There are so many unique places where letters reside: on food items, on appliance labels, in photos, on the remote control, even on the bottoms of our shoes! My guess is that this will be one of those preschool reading activities that a pre-reader will ask to do again and again.